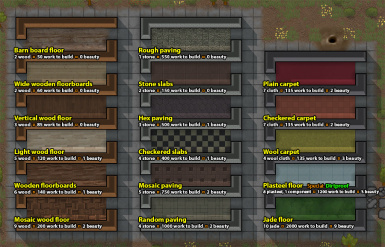 I made Pick a Color mod and it adds about 60 items (different colored wood and stone). Because of the way TerrainDefs work, making floors with all those colors of wood and stone is not something I can do without cluttering the hell out of the UI. 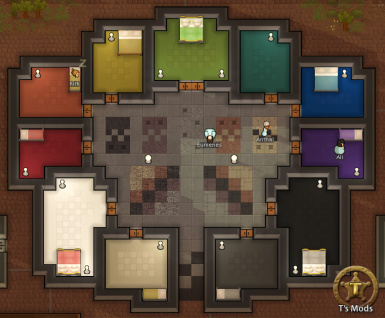 When people request I make it possible to do floors, I tell them to look to T's Mods if they want cool or colorful floors. They look so good + I used them so much during A16, I forgot they weren't vanilla. Great job! Alpha 17 update will be ready very soon - as always, thanks for your continued support! Just a quick post to say that I'll be updating for Alpha 16 as soon as I can - I should have it ready before Christmas. Hi, and welcome to the wonderful world of RimWorld mods! Short answer is yes, there should be no compatibility problems. To explain what you're seeing, 15 is the "major" version number that only changes whenever Tynan releases a big new shiny update for RimWorld. The longer number at the end is the "build number" which can change several times over the life of the current major version as Tynan makes bugfix releases. It basically takes the place of how Tynan used to release updates like 14b, 14c, and so on, before the game was available on Steam. Generally, TMods only have a chance of breaking when there is a new major version (like Alpha 16 which came out yesterday). It's not impossible for a minor build number change to throw a spanner in the works but it hasn't happened yet. Yo Telkir! Amazing work with these mods! I love how you've put the extra effort to keep them modular and organized, makes it really customizable. 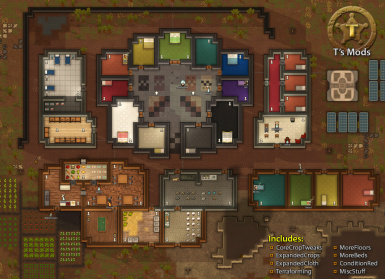 I personally use everything but the expanded agriculture (vanilla rimworld already has an overabundance of variety of crops for me) but your floors and terraforming in particular have become a necessity for my rimworld experience! I mostly just wanted to leave a bit of praise so you know your time and effort are thoroughly appreciated, but I have to ask: Will you be updating terraforming for alpha 14? I am anxious to mess around with the new patch, but I know that terraforming only works with new saves, so I am trying to be patient. But I realize you might not intend to update it for whatever reason, so I thought I would ask just in case. Thanks for your kind words DrummerD3, they're appreciated! To be honest there are at least two other mods I've seen recently that let you do essentially the same thing as Terraforming, although neither of them approach the problem in the way I'd personally like to play with. Probably, yes, I will update it - however, I want to act upon the good feedback that got posted in the Ludeon forum thread some while ago regarding the mod's balance and implementation, and it's just finding the time between Real Life and other games to actually get that done. Let's say this, that I'll do my damnedest to get it updated before the end of this Saturday. Stay tuned and thanks for being patient! After some testing, I noticed that the Royal Beds (red, blue, etc, from your MoreBeds mod) do not activate the bonuses from having furniture like a dresser or end table adjacent to them. Normally they add Comfort or Rest Effectiveness, but they say (inactive) next to these royal beds. Works fine with vanilla royal beds. Sorry for the really late reply - I don't check here as often as I should do. I did some XML adjustment in the v1.11.0 update of MoreBeds for alpha 14 to try fix this. I'll test it out as I update things over the next day or so. I tried to use this mods on my game but all soil areas turned to sand... Can i fix it? Is the newest version also compatible for us who only have version 9? No, v1.7.0 is only compatible with Rimworld alpha 10. I have a habit of removing old downloads to avoid confusing folks with what files they need, but you can still get T's Mods v1.6 for alpha 9 via the files, or at this Mediafire link if you need it. Hey, I'm sorry that you feel I've been selfish with the design choices for this mod. I would argue that had I been truly selfish then I would have bundled all of my changes into a single mod rather than trying to keep them modular. Unfortunately Rimworld modding currently requires you to overwrite vanilla items to make certain changes; it's simply not possible to replace the graphic of an existing Rimworld item without redefining it. 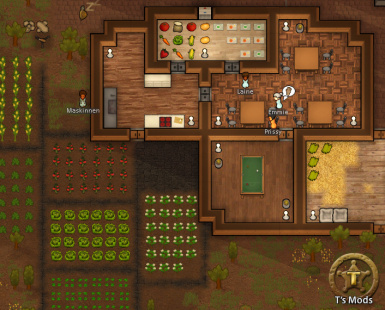 Changing the looks of the game's crops was my personal choice, as was giving them individual colonist thoughts when eaten raw. Likewise, if you want to - for example - add a new cooking recipe, you must either redefine the vanilla cooking stove to include it, or create an entirely new cooking workbench so your colonists can access it. The first version of my mod only added one recipe, and it seemed a bit redundant to make a whole new workbench just for that. TL,DR - I've tried to add things I felt were fun in a modular, logical way. I will happily try to work on any suggestions anyone has to improve compatibility. Happy Rimworlding! There was a problem with one of the 1.5 versions where it was missing the texture for blackberry bushes - if you download 1.5.2 then that should be fixed. * Start the game again and either create a new colony or load an existing one.